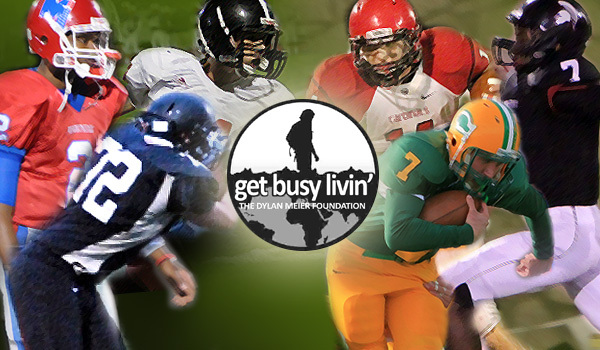 Kpreps is proud to announce the finalists for the 2012 Get Busy Livin' - Kpreps Player of the Year Award promoting The Dylan Meier Foundation. The award is in honor of Dylan Meier, a former All-State quarterback at Pittsburg High School and starter at Kansas State University who died in a hiking accident at the age of 26. The annual award will go to one Kansas senior who not only has shown excellence on the field but has also demonstrated the values that Dylan embodied and Get Busy Livin' (GBL) strives to promote: adventure, fitness, curiosity, generosity and a daily zest for life experiences. Players from around the state were nominated. The nominees were then pared down to 30 before the GBL committee narrowed the list of candidates to six. The University of Kansas recruit passed for an astounding 5,678 yards and 69 touchdowns in his career with the Stags. Cozart was picked first-team All-State by The Topeka Capital-Journal, Kpreps.com and Hovpen Sports. He also was the 2011 Kansas Gatorade Player of the Year, and the 2011 Eastern Kansas League Offensive Player of the Year. As a senior and team captain, he led the Stags to the Class 5A state championship game. Off the field, Cozart is a member of the Miege Campus Ministry Team, the National Honor Society and is a leader for Unitown, a diversity retreat. He also serves as a tutor at St. Agnes Grade School and serves holiday meals at a local food kitchen. The Oklahoma State recruit for football and track and field helped the Spartans to a 9-2 record in his senior season. Morrow was a standout as a receiver, defensive back and return man, but he also has excelled in track and field. A two-time state champion long jumper, he owns the Kansas high school record with a leap of 25 feet, 8.5 inches. In football, he was recruited by numerous Division I schools and earned All-State honors by many media outlets. Morrow is a member of the St. James Missionary Baptist Church. He is president of the Strength and Power Club at Emporia High School and enjoys working with students with special needs. He donates blood to Emporia’s Red Cross. The Kpreps.com 2012 Class 5A Offensive Player of the Year advanced to at least the sub-state game in all four of his seasons with Bishop Carroll. As a senior, he led the Eagles to a 13-0 record and the Class 5A state championship. Palmer directed an offense that put up more than 52 points per game. He completed 71.5 percent of his passes, throwing for 2,333 yards and 22 touchdowns with only two interceptions. Palmer also rushed for more than 530 yards and 13 touchdowns. He received All-State honors from several media outlets. He has committed to Butler Community College. Palmer has volunteered for Catholic Charities, working the Lord’s Diner that provides meals for the needy. He also has been active in the Center for Hope and the Twilight Walk for children with cancer. Palmer also serves on the high school’s leadership team. The University of Missouri recruit has been a dominant force on the offensive line as a starter for the Tigers the past two seasons. At 6-foot-6, 275 pounds, Rhodes has earned All-State honors from numerous media outlets and was named an All-Kansas offensive lineman by ESPN. Rhodes, a team captain, helped Blue Valley reach the Class 5A state championship game in 2011. In addition to Missouri, Rhodes was recruited by LSU, Oregon, Oregon State, Oklahoma, Oklahoma State, Kansas State, Kansas, Nebraska, Stanford, Iowa State, Indiana, Minnesota and Arizona State. Rhodes has volunteered to be a peer mentor/tutor for special needs students the past two years. This includes taking students on field trips, to dances, campouts and other social events. He also volunteers for the KC Metro Challengers football program, various youth football camps in Johnson County, Harvesters and the annual Della Lamb Toy Drive. His hobbies include fishing and hiking. The Northwest Missouri State recruit passed for 2,278 yards and 24 touchdowns his senior season and 5,123 yards and 47 touchdowns for his career. The first sophomore to start at quarterback for Lawrence High, Strauss also rushed for 1,972 yards and 30 touchdowns in his career. Strauss also served as a punter and return man for the Lions. He earned All-State honors by numerous media outlets. Strauss led the football team’s participation in a local food bank. He is active in FLA, Link, Christmas Adopt a Family, the National Honor Society and the team’s youth football camp. He earned a 30 on his ACT and boasts a 3.7 grade-point average. The Kansas State recruit was the Kpreps.com 2012 Class 3A Offensive Player of the Year. Wood played quarterback, running back and linebacker in high school, but is being recruited as a defensive end by the Wildcats. He rushed for 2,709 yards and 39 touchdowns as a senior, which included a state-record 659-yard and nine touchdown effort in an 84-56 win over Chaparral. Wood, 6-5 and 240 pounds, also recorded 105 tackles as a linebacker. He was the Central Plains League Offensive and Defensive MVP and received All-State honors by numerous media outlets. Wood is involved in the National Honor Society, Student Council, the Battle of the Birds Canned Food Drive, the Special Olympics, Tornado Relief Cleanup, Citywide Cleanup, Steering Committee, Cardinal Council and is a youth football volunteer. That zest for life is the basis of the Get Busy Livin’ Foundation that was established in Dylan’s honor. The mission is to provide support for individuals and groups that embody the values that Dylan pursued: adventure, fitness, curiosity, generosity, and a daily zest for life experiences. The GBL Foundation is determined to breakdown the boundaries that keep people from living life to the fullest, whether those boundaries be social, economic or imaginary. Photos courtesy of PrepsKC (Rhodes, Strauss, Palmer), Andy Taylor of the Montgomery County Chronicle (Wood), Laura Schwinn (Morrow), and Matt Gilmore (Cozart). Artwork arrangement by Andy Wachter (Kpreps.com).